Most of the changes to this macro are invisible. The macro now will find and correct additional types of numbering that it passed over previously. 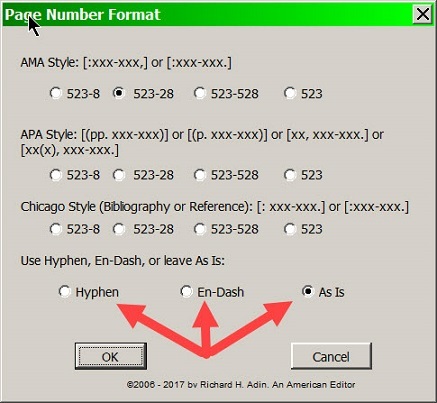 However, some new functionality has been added: the macro can now change hyphens to en-dashes, en-dashes to hyphens, or leave the separator in a number range as it is. The default is "as is". When you select the format style to use, you can also select the separator to use. The macro will make any necessary changes in a number range. The original Page Number Format macro was limited to finding numbers at the end of a reference. The new version gives you choices as is shown in the following image. The x's in the pattern signify numbers but not the quantity of numbers. And note that some patterns include beginning and/or ending punctuation. 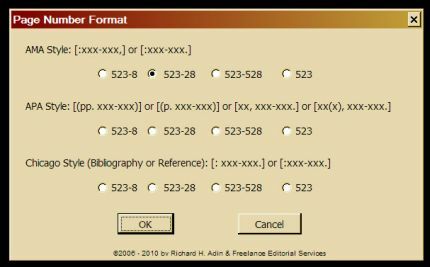 If you choose APA style and choose 523-528, each of the four examples above will be changed so that 328-29 becomes 328-329. If you choose 523-8, each instance of 328-29 will be changed to 328-9.